Wood Design is an amalgamation of many different disciplines, all centered around a common starting point: wood and forest products. 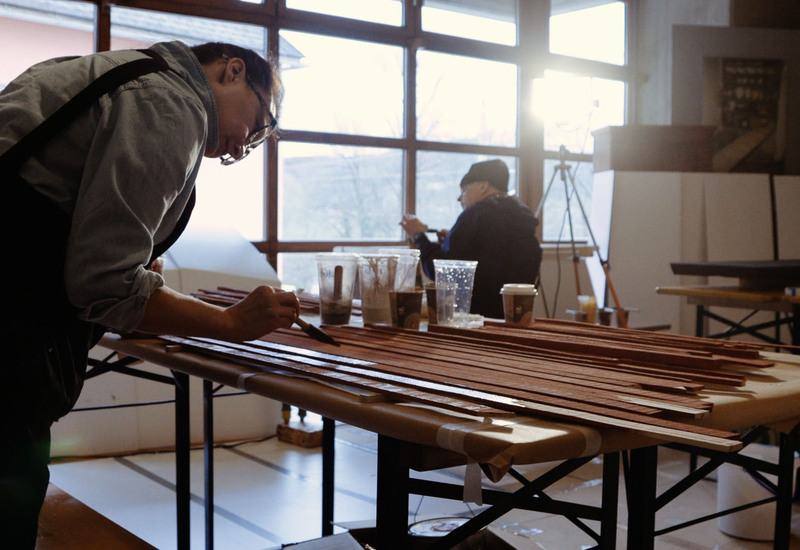 Led by Wendy Maruyama, the Wood Design team comprises practitioners in in contemporary furniture making, design and installation/sculpture. Members of the team all utilize this material as a problem solving tool, looking for new and unique ways to understand and manipulate it. Wood design takes a contemporary look at a timeless material and asks, “what more can we do with this?”. The cooperation process is an ongoing effort to emphasize the material as a global language. 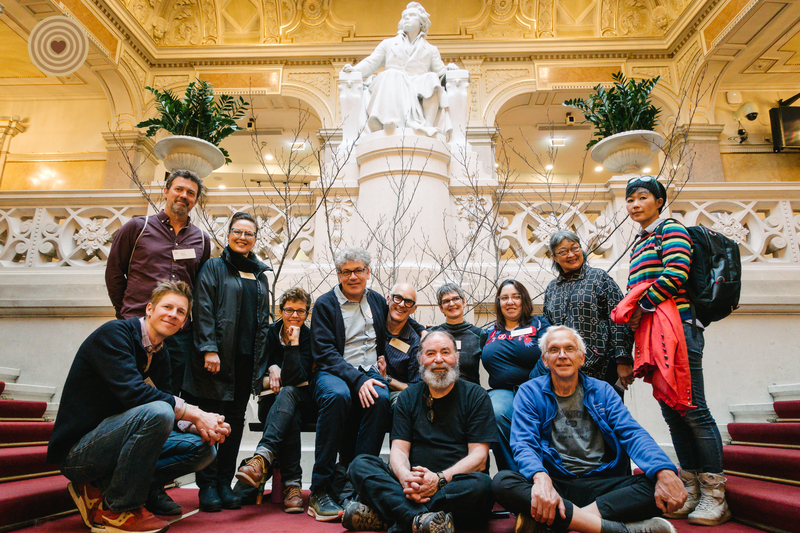 The program aims to explore the material’s potential for addressing a variety of concerns in culture and nature that also reflects the annual theme. Furniture maker, artist and educator Wendy Maruyama has been making innovative work for 40 years. Her work moves beyond the boundaries of traditional studio craft and into the realm of social practice. Her latest work, The wildLIFE Project, focuses on the endangerment of wild animals, particularly the elephants, rhinoceros, and pangolins. While researching the problems of animal poaching around the world, she recently took a sojourn to Kenya and met with wildlife advocates to investigate the dangers of the continued poaching of elephants, and to also experience the shared space with these magnificent animals. The resulting works sends a strong societal message that these animals will no longer exist if mankind continues to disregard the lives of all wildlife. Immersed in an international environment, Buck gained an appreciation for multiculturalism and exposed to the many cultural and geographical wonders of the world. Inspired first by African and Oceanic artifacts, his fascination with unique artistic perspectives and global interpretations of the natural world has guided his creative practice as a furniture designer and artist. An active maker for more than 25 years, Andy Buck has presented his work in over 100 exhibitions in galleries and museums in the United States. Bringing together traditional craftsmanship, investigations in form, pattern, and colorful painted surfaces, let’s wait and see what kind of “Change” will he bring to the World Wood Day 2019. This is the first time for BA Harrington to be part of the Wood Design Team. BA is an artist with a trained cabinet and furniture making background. Harrington’s artistic practice involves intensive object studies regarding historical furniture from her ancestral and vocational lineage. BA’s investigations focus on archetypal early American forms made specifically for women, reclaiming them from the world of male production where they receive much of their scholarly attention, to consider the historically feminine world of their use. Jenna Goldberg is a Providence, RI based artist working primarily making furniture and Jewelry Boxes. She received her BFA in Illustration from the University of the Arts in Philadelphia in 1990 and got her MFA in Furniture Design from Rhode Island School of Design in 1994. Her work has been shown in numerous solo, group and museum shows around the country. It is in the permanent collection of the Mint Museum of Art and Design in Charlotte, NC , The Fuller Museum and the Renwick Gallery in Washington DC. Jenna has done several artist residencies including two years at Anderson Ranch Arts Center and also a Windgate funded residency at San Diego State University. She has been the recipient of the North Carolina Arts council award and also the Rhode Island Council on the Arts award for Crafts in 2005 and 2012. Winkle is a maker who creates furniture and objects using wood and paint; her work displays a balance of form, color and surface pattern. She has exhibited nationally and internationally, including SOFA Chicago, Wanted Design NYC and the Architectural Digest Home Show. Her work has been included in a number of publications, including Fine Woodworking and Woodworker magazines and the books 500 Tables, 500 Chairs. Winkle has been awarded several artist residencies, including the International Turning Exchange at the Center for Art in Wood in Philadelphia, the Windgate Artist Residency at State University New York (SUNY) Purchase, Haystack Mountain School of Crafts, the Vermont Studio Center and at the Appalachian Center for Craft. She was awarded a State of Tennessee Individual Artist Award in 2011 and the Society of Arts and Crafts (Boston) John D. Mineck furniture fellowship in 2014. Winkle is an Associate Professor and Director of the School of Art, Craft & Design at Tennessee Technological University. She holds a Bachelor of Fine Art in Ceramics from the University of Oklahoma and a Master of Fine Art in Furniture Design from San Diego State University. Her workshop teaching experience includes, Arrowmont School of Arts and Crafts, Anderson Ranch Art Center, Haystack Mountain School of Crafts, Penland School of Crafts, The Center for Furniture Craftsmanship, John C. Campbell Folk School and the Appalachian Center for Craft. I have been a professional woodworker since 1975. 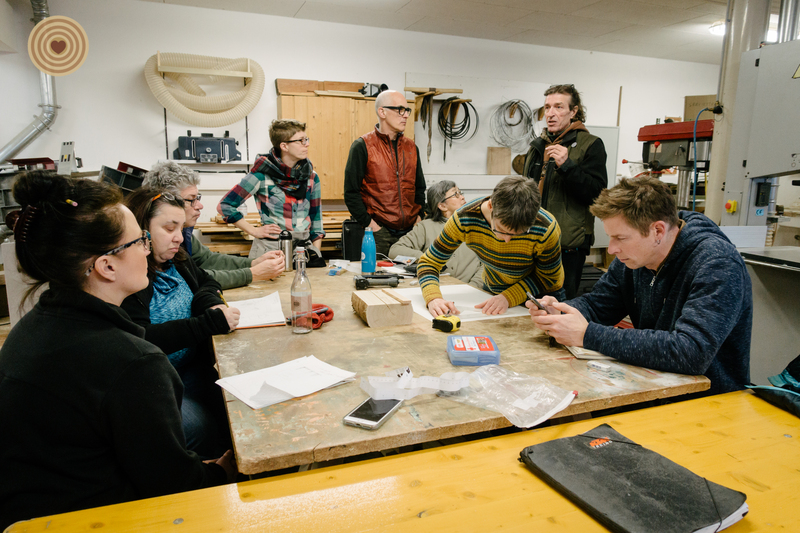 I have taught in the Wood Department of Oregon College of Art and Craft from 1993 to 2017 and taught children woodworking at Catlin Gabel School from 1996 until 2013. I received an MFA in 2001 from Minneapolis College of Art and Design and had been an adjunct professor in the BFA program at OCAC since graduating. I use various methods of subtracting and adding, bending, and joining wood to create asymmetrical forms with compound curved surfaces. I have carved, turned, cut into segments, steam bent, bent laminated, veneered, painted, and stitched together. I use vacuum bags, steam, spray guns, dental tools, sewing tools, woodworking hand tools, and machines. My training is furniture making, my inclination is sculpture. In 2011 I was a Windgate International Turning Exchange Fellow at the Center for Art in Wood, Philadelphia, Pennsylvania. In 2009 and 2012, I traveled to Teshie, Ghana, West Africa to study with Eric Adjetey Anang, maker of design coffin, also known as Abebuu Adekai (“boxes with proverbs”). Since my study with Eric, I have been making carved and painted hollow sculpture, including a 6-foot Salmon box; a 6-foot human mask; a series of smaller masks based on mug shots of people who have been arrested and my family; and life-size salmon and trout boxes. My work explores stories both natural and mythical, irreverent and sacred, pragmatic and sublime. Mike Oleson received his MFA in Furniture Design from San Diego State University. He has been living in Lisbon, Portugal, since 2007, where he established his own woodworking studio and is frequently commissioned to make a wide range of furniture. He enjoys the collaborative design process of working with clients to meet their specific needs. Mike is often inspired by the architecture in the places he lives and visits: the use of patterns, decorative details, and color schemes that are unique to each locale. Trained in Tasmania, Peter has been designing and making objects for over 30 years and still gets excited exploring ideas through materials and making. He was previously Head of Furniture Design at the JamFactory in South Australia, spent 10 years as Associate Professor at the Rhode Island School of Design in the USA and is currently a senior lecturer at the University of South Australia. He works from his studio in the Adelaide hills making wooden surfboards, sculpture and furniture designs. Peter has exhibited extensively in Australia and the USA where his work is represented in public and private collections including the Australian Parliament House and the RISD Museum of Art, USA. Tom Loeser (Madison, Wisconsin) was born in Boston, Massachusetts in 1956. Loeser served as Chair of the University of Wisconsin-Madison Department of Art from 2009-2014 and has been head of the wood/furniture area at UW-Madison since 1991. He holds a BA from Haverford College (1979), a BFA from Boston University’s Program in Artisanry (1983) and an MFA from the University of Massachusetts-Dartmouth (1992). Loeser designs and builds one-of-a-kind functional and dysfunctional objects that are often carved and painted and always draw inspiration from the history of design and object making. In 1993, he spent six months in Japan on an NEA Creative Artist Exchange Fellowship. In 2003 and again in 2017, he spent six months teaching and researching in London. In addition to producing studio furniture, Loeser has also worked on a number of public commissions and site-specific installations. He collaborated with his wife, Bird Ross, on the design and fabrication of the highly kid-friendly, very interactive, and not at all traditional reception desk for the new Madison Children’s Museum. In 2013, Loeser worked with willow furniture maker Dave Chapman and built three large willow and steel pod forms that are permanently installed reading retreats in the children’s section of the new downtown public library in Madison, Wisconsin. His work has been featured in many national and international exhibitions and can be found in important museum collections including the Brooklyn Museum; Fuller Craft Museum, Brockton, Massachusetts; Museum of Arts and Design, New York; Racine Art Museum, Wisconsin; Rhode Island School of Design Museum of Art; Smithsonian American Art Museum’s Renwick Gallery, Washington, DC; Smithsonian Cooper-Hewitt National Design Museum, New York; Yale University Art Gallery, New Haven, Connecticut, and many other institutions. Loeser’s solo exhibition Please Please Please is currently traveling to three venues in California and Texas. He was elected to the American Craft Council College of Fellows in 2012. Yuri Kobayashi is a New England based Sculptor and furniture maker. Born and trained woodworking in Japan, then she moved to the U.S. for her MFA degree, studied under Wendy Maruyama. Employing her discipline in traditional woodworking, she strives to capture her wonder and emotional nature in abstract format. Yuri exhibits nationally and has been awarded residencies, grants, and fellowships. While maintaining her studio practice, she serves as a part-time faculty member in the Department of Furniture Design at Rhode Island School. Jenna Goldberg created a free “little library” structure that houses books on the topic of bees, beekeeping and colony collapse disorder. She is combining her personal aesthetic of using color and pattern with the structure and aesthetic of the Austrian buildings on the facility in Stübing. Change comes with education. A free little library is a good metaphor for the democratization of information. Kim Winkle’s hall table uses her trademark turned elements with built furniture forms. The changes that the material goes through; from round, to rectilinear, and then back to round, is also topped oﬀ with the use of the stylized shingle forms that honors the traditional Austrian vernacular architecture found within the museum compound. The sheathing of shingles over the table form, and the layers of paint that changes as they are revealed through sanding is indicative of change, much like new growth that emerges from old growth. BA Harrington has extensive research invested in the history of early American vernacular dowry chests, and was naturally inspired by the Austrian style of vernacular furniture. Her work, Hope Chest, is a diﬀerent interpretation on the dowry chest and has taken on the word “hope” literally, and in 6 languages, as a message of hope for peace and change in the world. Collaborating for the ﬁrst time, Peter Walker and Yuri Kobayashi created a large installation made of materials culled from the clearings from the forest around the museum. They are both sculptors whose works incorporate both fabricated and natural wood parts. Their works utilize the emotive quality of wood, both in its natural state and with its tensile abilities. Considerable time was spent selecting branches, stripping them of bark and laying out the framework. They will begin lashing and joining sections together. The theme of change honors nature at its fullest, and harnesses the energy via the transformation from the tree form to its ﬁnal state. Tom Loeser’s bench incorporates cuttings from the surrounding forest of the museum. Tom’s own whimsical works often reﬂect the environment of the surrounding farmlands of his hometown in Wisconsin. Here in Stübing, the bench he is creating is a space for reﬂection and contemplation. With our shrinking forests, the bench serves as a quiet reminder of the importance of forest sustainability and the shelter and sustenance that trees provide. Change is needed to ensure that the forests will thrive. Nearly everyone undergoes change throughout their lives; whether it be a physical move from one place to another, or switching professions, or having a family (or not). Michael Oleson’s folding screen can be used to change a space by dividing it. It is also providing a narrative about his life’s changes that have been most impactful in his own life. Being two sided, the screen will depict his geographical moves, and the other side the panels will abstractly depict the life process from being a child who grows up and then becomes a parent. Seeds of Change was created by Katie Hudnall: when ﬁrst approaching this work, one thinks of a small, newly-evolved creature with three legs. Upon closer inspection you discover a small drawer pull: opening the drawer reveals a small maple tree seed (called samaras) found here at the museum, as well as dozens of seeds at the back of the drawer. Also when you open the drawer it pulls open a small samara-shaped ﬂag attached to the top of the back leg to reveal a large eye. Katie was thinking about climate change, the resilience of the natural world and humanity’s relationship with it. Immediately upon hearing about World Wood Day and the theme of Change, Michael deForest (USA) began to think about tricksters and change agents, those among us who see things diﬀerently and ﬁnd ways to advocate and push for positive change. Tricksters are written about in myths and creation stories. They are usually presented as messengers between the gods and people and are guides through portals and gateways. They guide us to new understandings about values, culture, and traditions. Sometimes our vision and understanding can become rigid to the point that it no longer serves our values. Someone can become an agent for change when they see a new perspective, a diﬀerent understanding to an otherwise generally accepted view. Malala Yusufzai is such a courageous example. Her bold promotion of education for all despite tradition has made her a true cultural leader. She does not seek out support but forms it with her compassion, vision, and integrity. Michael chose to portray Malala in a 9x life size carved wood portrait using bold paint colors and present her image with her eyes at normal eye level so one can contemplate who she is and what she means to the world. Inspired by the European tradition of marionette puppets and wooden toys, Andy Buck created a carved and painted ﬁgurative piece with moving wooden legs. Using the imagery of the local surroundings, such as solid slatted doors and timber framed joinery, Andy is assembling an abstracted ﬁgure whose multiple legs represent the many individual voices who have traveled to share knowledge and friendship. We marvel at those who try to bring a marionette to life with movement and a personality: we too are changed as we imagine it happening. Through art making and work with our hands, we change or transform bare material and bring it back to life imbued with our experience and knowledge almost like a puppeteer.